Writers often use the word “venerable” to hedge their bets. Most often, when I see the phrase “venerable institution,” I think of a place that’s dated and irrelevant, but still standing—like most of Congress. To be honest, that’s how I would have described Riverhorse on Main a few years ago: It has weathered the years and culinary fashions but had become dated and hardly relevant. It wasn’t even on my Top 10 list of best restaurants on Park City’s Main Street. So no one was more surprised than I to discover that not only is Riverhorse on Main relevant again, but it’s offering up some of the best fare in Park City, a town with more excellent restaurants than you can shake a spatula at. Long before all those other award-winning Park City restaurants, there was the Riverhorse, which opened on New Year’s Eve in 1987. In 1995, it became the first Utah restaurant to receive the prestigious DiRoNA Award, and in 2000, became the Beehive State’s first establishment to be awarded the Mobil Travel Guide Four-Star Rating as one of the top restaurants in North America. Many other accolades followed, including AAA Four-Diamond Awards and numerous recognitions of distinction by Wine Spectator. Still, by the turn of the millennium, I, along with many other food and wine lovers, had lost interest. The Riverhorse just seemed tired, from the décor and service to the cuisine. Enter Seth Adams, who was hired as executive chef in 2004. The food got better; then, in 2011, Adams purchased Riverhorse on Main with a partner and began to make it his own. When I visited recently, the décor and ambience had undergone such a thorough transformation that I hardly recognized the place. Beautiful wood floors and exposed brick blend with metal and stone, along with crisp, white tablecloths and cerulean banquets. There’s a snazzy bar area, and the menu itself, bound in what looks and feels like hemp, is beautiful. This ain’t your daddy’s Riverhorse. You’re in good hands with a professional server like Michael Freyvogel, formerly of The Metropolitan, who will start you off with tempting libations and an amuse-bouche from Chef Adams. The Riverhorse has an enviable wine list, as well as a collection of craft cocktails and such. Wanting to start out with something light, we ordered the Ahi Tuna Duo appetizer ($15), which was anything but appetizer-size. It was a generous plate, divided in half, with sliced sashimi-grade tuna raw on one side, and minced poke-style tuna tartare on the other, served with shredded green papaya, yuzu and crispy fried wonton wedges, and sprinkled with black & white sesame seeds. It’s a superb starter. Just as great—for those who would lean toward a richer opener—is a decadent appetizer of housemade oxtail ravioli ($17) served with slices of crisp duck breast and bathed in a creamy foie gras emulsion with toasted baguette slices for soaking up that heavenly sauce. It’s a dish so delicious it took days for me to get it out of my head. We sipped Michael Thomas Sancerre 2012 ($56 per bottle), from the Loire Valley in France—just one of many options on a top-notch wine list that ranges from wines by the glass for $10 to a double magnum of BV Georges de Latour Cabernet Sauvignon 2007 for $895. I don’t often get excited by salad, but the poached pear & burrata salad at Riverhorse on Main is outstanding. It’s a tender poached Anjou pear on microgreens with a dollop of silky burrata cheese, strewn with stuffed dates and dark figs, and drizzled with local honey and barrel-aged balsamic ($13.50). Throughout the evening, diners were treated to live music by talented singer-guitarist Matt Frey; The Riverhorse frequently features entertainment from Frey and other local musicians including Joy & Eric, Jeff Proctor and Mister Sister. 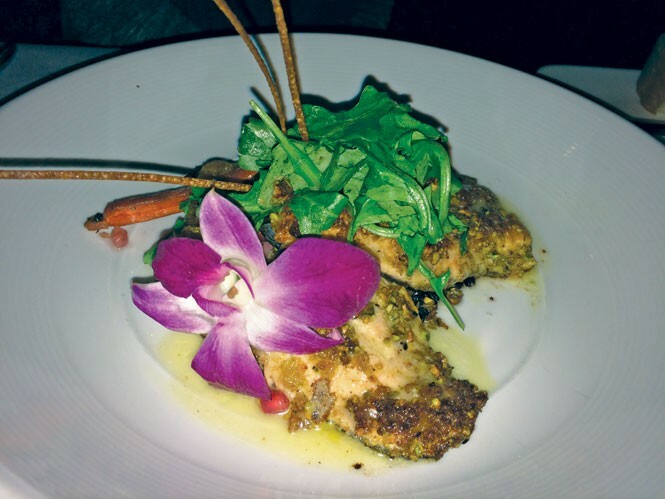 For as long as I can recall, The Riverhorse’s signature dish has been macadamia-nut-crusted Alaskan halibut ($38.50), and it’s not surprising that it’s very, very good. However, we decided to branch out and try the Utah red trout ($36)—and I’m glad we did. Tender, flaky trout fillets rest on a bed of black “forbidden” rice with orange and yellow roasted carrots and arugula, garnished with edible flowers and pomegranate-fennel “salsa.” It’s as tasty as it is colorful. You don’t see veal chops on many menus anymore, and I’m always drawn to them when I do. Usually, though, I wind up disappointed by overcooked, dry chops. Not so at The Riverhorse, where Chef Adams knows what to do with a gorgeous, bone-in veal chop ($40). Mine was grilled perfectly to medium temperature—so tender I hardly needed teeth to chew it. It came with housemade mushroom pirogies, shallot- bacon jam and shoestring fried spuds, and it was sauced with roasted garlic-tomato sofrito. It was a sensational dish, right down to the pirogi. It turns out that Adams, who hails originally from Pennsylvania, learned from his grandmother how to make them. In my opinion, they deserve to be a dish of their own: maybe “Grandma’s pirogi in brown butter”? Stuffed to the gills, but enjoying ourselves, we decided to indulge in the Dutch apple cake ($13). It’s irresistible, served in a cast-iron pot with vanilla ice cream, hot caramelized butterscotch and pecans. The perfect finishing touch to a fine Riverhorse on Main meal—especially since we weren’t driving—was River Horse Coffee ($13), a sensuous blend of coffee, Godiva liqueur, Kahlua, Cognac and Benedictine. With Riverhorse on Main firing on all cylinders under owner/chef Seth Adams, who knows? It might just be around for another three decades, creating meaningful dining experiences.